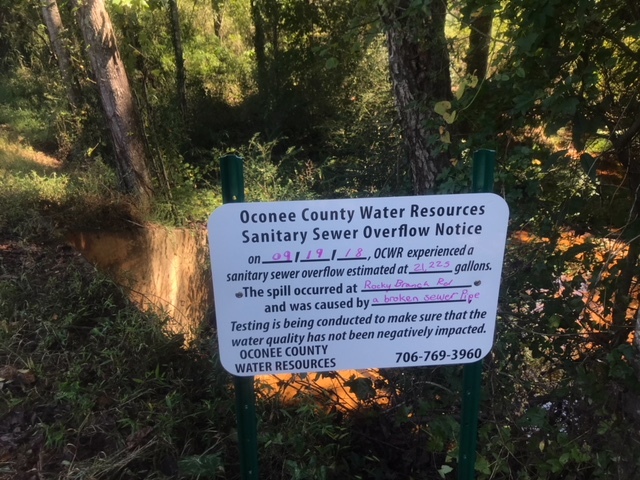 The county notified the Georgia Environmental Protection Division and the Oconee County Environmental Health Department of the spill, according to the news release, and it began testing upstream and downstream water quality. The county also placed signs at the site notifying the public of the spill. The spill was the fourth reported by the county this year. According to the county news release, the Oconee County Water Resources Department was notified of a sewer odor on Rocky Branch Road across from Old Waverly subdivision just after 9 p.m. on Tuesday. Water Resources Department personnel responded and found a “sewer flow emerging from a dirt driveway” across from the subdivision, according to the release. Water Resources personnel neutralized the spill area by applying lime, according to the report. The sewer main was repaired and back to normal use by 3 a.m. on Wednesday, the county reported. The county will notify the state Environmental Protection Division of the results of its lab analysis of water taken from the site, as is required for a major spill, the county stated. In January, the county reported a major spill when operational problems at the Calls Creek wastewater treatment plant on the northeast of Watkinsville caused a discharge of partially treated wastewater into Calls Creek. In February, the county reported that the Calls Creek plant exceeded permit limits for total suspended solids in the effluent concentration of wastewater discharged to Calls Creek. The county has upgraded that plant since these events occurred. In July the county reported a spill on a tributary to Calls Creek in Watkinsville resulting from a blockage to a sewer line feeding the county’s Calls Creek wastewater treatment plant. There is a system in place to detect leaks from water pipes. Is there no similar system for sewer pipes?